Arriving in Bombay feels like being dropped into another world. The honking of the cars is unending. Throngs of people push against each other and surround the airport. There are beggars wherever there is the hope of finding a tourist. Some reach out to touch you, others hold their stomachs or beseech you with their gaze as they hold their outstretched palms to you. Children will call you mama and ask for money. Cardboard homes line the road from the airport into the city. Once, I was helped into the airport with my bags by two men who insisted they had a shortcut through the crowds. I watched as they began to disappear into the throng of people and only upon my firm insistence did they enter the terminal. After sunset I walked from my room at the Taj Majal Hotel of Mumbai to the Gateway to India, a grand old colonialist archway looking out on the Arabian Sea. It is a long-ago territorial claim by the British, a symbol of their sovereignty. This was my first ever view of the Arabian Sea. Where was Scherazade? I learned to cross streets very cautiously. While auto rickshaws make noise the bicycle rickshaws travel in stealthy silence. 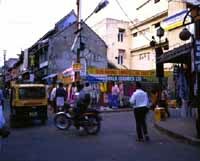 I looked down while walking in the taxi lane across the street from the Taj Majal Hotel and saw a young child of perhaps two or three asleep on the pavement. He was wearing only a dirty yellow long-sleeved shirt and using a concrete parking barrier as his pillow. Each day I reminded myself there, but for an accident of birth, there, but for the grace of the gods, go I.
I found myself constantly confronted with the deficiency of my knowledge of the complexities of the culture and politics of India. Each day I was reminded that my impressions were fueled principally by Western media and many volumes of colonial literature. Why for example was I unaware that the Indian Government had changed the Anglicized names of many of its cities back to Indian names? How could I not know that Bombay was now known as Mumbai? It often caused me to wonder on a daily basis if they would ever exorcise a colonial power that was so tightly woven into the fabric of their society. For all the temples that were desecrated, for all the rulers who were murderously overthrown and all of the thousands of years of culture they attempted to eviscerate, there are still many colonialist footprints that have become a part of India. Very quickly I learned to abandon my western logic. Why ask why? At the Taj Majal Hotel of Mumbai you may not order a double Johnny Walker however, you may order a double Indian Scotch. Imported goods of any sort are prohibitively expensive and equally rare. Please imagine my chagrin when I realized I had neglected to bring my swimsuit. The only ones that I found were in "resort" hotels and I soon abandoned any hope of finding something acceptable. It is no exaggeration to say that India is a sea of humanity, a mass of people. It seemed that everywhere that I went there were throngs of people pressing against me. There is no such thing as privacy. Anywhere you may go seeking solitude, there is another person. Life is a contact sport. If you enjoy the hubbub of humanity, of being a part of the pushing and jostling, of being visually assaulted by the brilliance of the color palette, of being subsumed within an ancient culture, you will find a place in your heart for India and her people. From Mumbai I ventured south to Kochi (Cochin), a small seaside town in the state of Kerala. Kerala is a state that is known for its high literacy rate and its matriarchal society. It was a pleasant experience to leave the crowds behind and to wander about in a smaller town. I hired a driver named Mani and explored some of the surrounding neighborhoods. At the time, I wrote of them as "slums of contentment" but later I came to realize that I was still viewing things within the limitations of my own prejudices. The streets I wandered, the neighborhoods I explored were impoverished only by my own view of them. The Taj Malabar Hotel in Kochi is where I had the best auyverdic massage of my life. It was the first ever symmetrical massage that I have experienced. I arrived at the pool and sat down at the welcome desk staffed by two women. They asked "your good name please," filled out some paperwork and showed me into the dimly lit massage room. One wall had a wooden shelf full of brown bottles of many different kinds of ayurvedic oils. In the center of the room was a long, flat wooden table that was a beautiful dark brown. The patina was no doubt from years of massages given and received here. I disrobed and lay on the table. Two women worked in complete tandem massaging my body, generously using their oils for over an hour. Each time I travel I am impressed by how similar we all are. A smile is universal and I have discovered that women everywhere share the same concerns. We are all mothers, daughters, sisters, girlfriends and wives. We all share the common concerns and bonds these responsibilities bring. We talked and laughed as they massaged my body and somehow kept me from slip-sliding off the wooden table. From the soles of my feet to the top of my scalp, they erased every care I had brought in with me. From the massage table they led me to a shower room where I was provided with handmade sandalwood soap. I showered and watched as the red oil-tinted water swirled down the drain. I left a generous tip and my unending gratitude. I remember writing in their guest book words of the most superlative praise. At every opportunity I got another massage. Nothing ever measured up to the ayurvedic Nirvana I found in Kochi. I awoke one night in my hotel in Kochi to hear what I feared was the scuttling of a mouse along the baseboards of the room. I could hear him gnawing on something. I was certain he was eating the Edam cheese I had brought with me from Amsterdam. What else would a mouse want? All things considered, there are some conflicts I would prefer to avoid, and confronting a mouse in a hotel room while standing in my bare feet is one of them. I decided I would just let the mouse go on and scuttle his way out of my room. The strategy would have worked but for the fact that he kept traveling the baseboards along the wall my bed was against. Finally, after a number of round trips, I couldn’t stand it any longer. I turned on the lights to assess the damage. My beautiful wax encased round of Edam cheese was untouched but the plate of cookies that was covered in saran wrap had been nibbled on. Very small holes were torn through the saran wrap and tiny bites had been taken from the cookies. I didn’t know there were such diminutive mice. Perplexed, I walked into the bathroom and found the culprit, a cockroach as large as a mouse was lying on his back with his legs flailing in the air. Unwilling to squash such a large and potentially messy creature in the middle of the night, I left him to his own devices. I am not sure if it was the saran wrap he ate, or spending the night on his back, but come morning all that remained of the cockroach was the lifeless shell of his body.